My translation of this famous Linear B was a hard slog, to say the very least. I had to rummage through Chris Tselentis’ fine Linear B Lexicon and through scores of entries in Liddell & Scott, 1986, to be able to come within sight of a translation which would make complete sense in context, and after hours of meticulous searching, I finally came up with the translation you see here. I think it not only rings true, but that it flies. There are several critical comments I must make on my translation. In case anyone is wondering why I translated KOROTO as “young boy”, you needn’t look very far. This is why that picture of a boy appears to the right of the tablet. The scribe must have deliberately put it there to make damn certain that his fellow scribes and literate Mycenaeans knew perfectly well what the main thrust of this tablet is, namely, that we should put the emphasis squarely on the “young boy” as subject. He is the driving force behind all this wool business going on here. This is precisely why I am quite convinced that KOROTO is in fact an archaic Mycenaean neuter word for young boy. Of course, the daughter mentioned here cannot be his daughter! She is someone’s daughter, and I would bet my bottom dollars that she is their mother. Moving on, we run smack dab up against the single syllabogram RE. We must not be deceived. It is not untranslatable. In fact, the direct opposite is true. Why on earth Linear B translators have not seen this phenomenon in the past 60 years is quite beyond me. I know perfectly well that single syllabograms are all over the place on Linear B tablets, because in the 3,000 odd Linear B tablets I have meticulously examined in Scripta Minoa, there are hundreds of tablets and fragments sporting single syllabograms. Two questions immediately leap to mind. First of all, why on earth would the Linear B scribes at Knossos, Mycenae, Pylos and elsewhere resort to inscribing single syllabograms on so many tablets (100s is a heck of lot of tablets!) unless they meant to. I think it goes quite without saying that that is precisely what they meant to do. Secondly, what on earth are these single syllabograms? Believe it or not, we have practically beaten this subject to death on our blog, and if you are really itching to know what they are (and if you are a Linear B translator, scholar or researcher, may I suggest you should be), then you ought to visit our blog and read the scores of posts which not only define what they are, viz. supersyllabograms, but provide scores of examples of Linear B tablets from Knossos which sport them, especially tablets referring to sheep, rams and ewes. Tablets on sheep constitute fully 20% and then some of all 3,000 Linear B tablets I closely examined from Knossos, far surpassing Linear B tablets on any other area of Minoan civilization (economic, agricultural, industrial, military, you name it). This of course raises another inescapable question. Why, why such an overwhelming number of Linear B tablets on sheep alone – even far surpassing all other livestock, crops etc. etc. - ? This is one critical question, and it demands answers. I have provided some myself, but it is up to the research community at large to fully investigate this phenomenon and in depth, so that within a few years we can really account for supersyllabograms... because they will not simply go away. What does the sypersyllabogram RE mean? It was almost ridiculously easy for me to find that out. Consulting Tselentis once again, I discovered that the one and only Mycenaean Greek word beginning with the syllabogram RE that could possibly fit this context, i.e. that of wool, is REPOTO, which means “fine or thin”, and it fits the context beautifully. Given that the repertoire of Mycenaean vocabulary on extant tablets and fragments in Linear B is quite thin, amounting to no more than 3,000 words at the very most, I think we can pretty much rely on this translation of the supersyllabogram RE, because nothing else fits the context, period. One thing I will tell you is this. The supersyllabogram O means ONATO, a leased field & KI means KITIMENA, a plot of land. These two are plastered all over tablets on sheep. There are plenty more. We have deciphered at least 8 of them, but the rest elude us... for the time being. Cf. ko-ro-to to χοροστάς “a feast celebrated with dances”. The figure on the reverse appears to be dancing. And while I have been slow to accept tu-ka-te-re as θύγατρα (tugatra) “daughter”, I may concede due to a possible context of a daughter’s wedding feast. Yes, it certainly does. And your alternate translation is excellent. As for TUKATERE, I pretty much accept the traditional meaning, unless of course you can come up with something else which fits the CONTEXT, as you know how much of a stickler I am for that. I shall modify my interpretation of this important post by inserting your comment here, and also by providing an alternative translation based on your own insights, of course duly acknowledging you as the AUTHOR of these particular comments, as goes without saying. This will make sure that your comments, as well as mine, are strictly under copyright. I will let you know once I have revised this extremely important post, so that you can see for yourself how I have incorporated your ideas. I know you will be pleased. Anyway, as I have said over and over on this blog, my translations, however competent or scholarly, are neither any better or worse than any other well-conceived decipherment. Yes I often wondered what the figure was on this tablet Richard. I thought he looked quite weird, something like a court jester. Like your translation of it though. Thanks! I worked hard at it! I think that is the reason the boy is there. 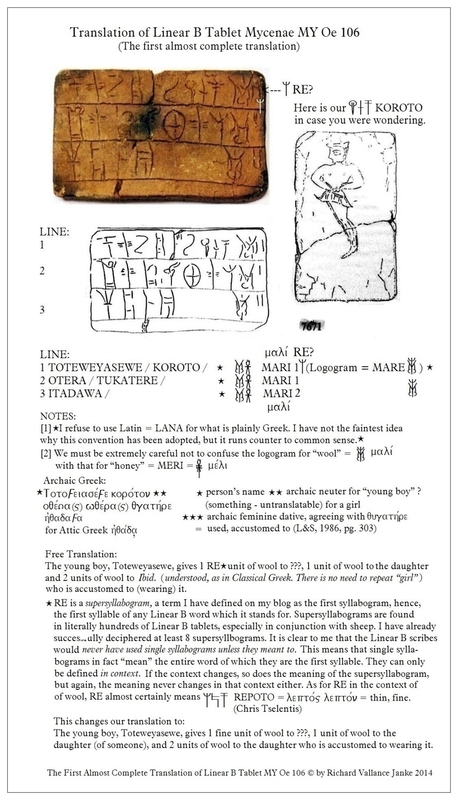 Those Linear B scribes had all sorts of tricks up their sleeves, eh! I guess you are learning ideograms and supersyllabograms considerably faster now, as I see you are reading ALL my posts and translations. And the more translations you read, the better you will get at doing your own. « Linear B Keyboard Layout: to date the best on the Internet!